Ingredients for Life on Gliese 581g? Just in case you haven’t heard, astronomers have released news about an “Earth-like” exoplanet orbiting within the “Goldilocks zone” of a star some 20 light-years away. This is awesome, but does it mean Gliese 581g is habitable? Does it mean life is already slithering across its surface? Judging by an exuberant claim by Steven Vogt, professor of astronomy and astrophysics at University of California Santa Cruz, one would think we now know there’s life on this strangely familiar world. “Personally, given the ubiquity and propensity of life to flourish wherever it can, I would say that the chances for life on this planet are 100 percent. I have almost no doubt about it,” Vogt told Discovery News when the announcement broke on Wednesday. Why did he say that his personal view was that the chances for life on Gliese 581g are 100%? At first glance, it is easy to see where he’s coming from. Firstly, the exoplanet orbits close to a small red dwarf star (called Gliese 581), with a fast-paced orbit of 37 days. This is important as the energy output of a red dwarf is tiny when compared to our Sun (which is a yellow dwarf star, in case you were wondering) — to receive an equivalent amount of heating as the Earth, Gliese 581g needs to be much closer to its star. Also, it isn’t orbiting too close. It is within the habitable zone (or the “Goldilocks zone,” i.e., a zone that’s not too hot or too cold) of the system. Therefore there’s a high probability that if water is present on its surface, it’s likely to be in liquid form. The presence of liquid water would be exciting as Earth Brand™ life likes liquid water. Secondly, Gliese 581g is small for an exoplanet discovered thus far. Weighing in at a minimum mass of 3x that of the Earth, it could certainly have some Earth-like qualities. This has another implication; the world has enough gravitational oomph to hold onto an atmosphere — another ingredient that life seems to like (assuming it’s not of the bone-crushing, lead-boiling, Venus-type atmosphere). But there’s a few complications. 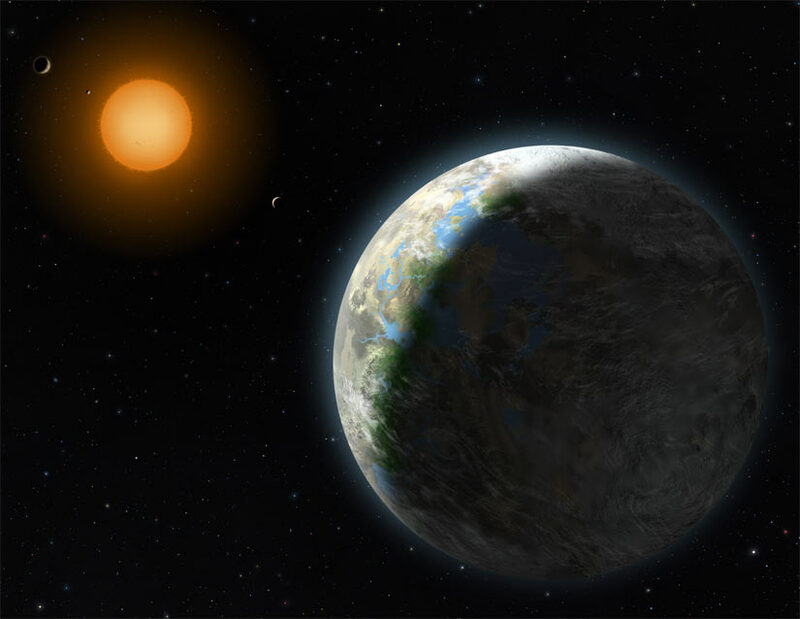 To be within the habitable zone of its parent star, Gliese 581g will be “tidally locked.” This means that one side of the exoplanet will always be facing the star. On the far side (or, indeed, the “dark side”) it will be cold whilst the near side will always be hot. Having one perpetual day doesn’t sound very Earth-like to me. But there is an upside to this strange orbit. So a tidally-locked planet could have a stable atmosphere and perhaps life could evolve as a result. What could be considered to be a negative has just become a positive. With all this good news, why wouldn’t life be thriving on this world? There’s still a lot of unknowns and assumptions being made. For a start, the presence of Gliese 581g was detected by measuring the “wobble” of the star as the exoplanet orbits (its gravity tugs on the star as it circles). Therefore its mass and orbital radius can be derived. But we have no information about its atmosphere; the world doesn’t pass in front (or “transit”) the star from our perspective, so we can’t get a peek into its atmosphere. Therefore we have zero clue as to whether it even has an atmosphere. It might not have an atmosphere, but then again it could have a very thick atmosphere — two extremes that would would put a stop to any Earth Brand™ life evolving. Also, we have zero clue if there’s any water there, it’s just guesswork that suggests there might be. There’s also the huge unknown as to whether life is ubiquitous in the cosmos or not. It’s a bit like baking a loaf of bread when you have all the necessary ingredients to make bread, but you have no clue about what quantities to use. Gliese 581g appears to have most of the ingredients for life (and with a few assumptions, it has all the ingredients for life), but we only have a general idea as to what quantities these ingredients come in. If you threw flour, water and yeast straight into the breadmaker in random quantities, would you get a loaf of bread? What if you forgot to add the yeast? Gliese 581g is that breadmaker. Unfortunately we have no clue if it can make bread. Okay, you say this planet doesn't have days and nights. The sun is always in the same position. How is this earth like? It's still very exciting to know that I might be around when a habitable world is discovered. Just to let you know stars,planets,galaxy etc have a share of just 0.4% in our universe….rest is still DARK ENERGY+DARK MATTER.